According to Wikipedia, Jagaddhatri or Jagadhatri (Bengali: জগদ্ধাত্রী, Devanagri: जगद्धात्री, Oriya: ଜଗଦ୍ଧାତ୍ରୀ, 'the Protector of the World') is an aspect of the Hindu goddess Durga, who is particularly worshipped in the West Bengal region of India. Her cult is directly derived from Tantra where she is a symbol of sattva beside Durga and Kali, respectably symbolized with Rajas and Tamas. She is celebrated on Gosthastami. 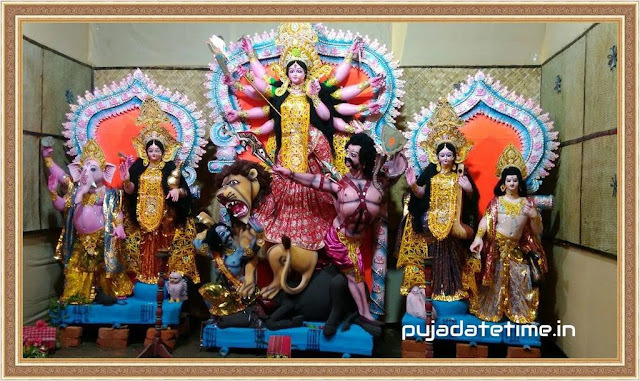 It is also referred to as another Durga Puja as it also starts on Asthami tithi and ends on Dashami tithi. The date of the puja is decided by the luni-solar Hindu calendar.